I started off thinking I’d post on this because it was a thing of beauty, even though it’s not very current – and then I realised, it sort of is current, in a funny kind of way. (And anyway, why need we always privilege novelty over substance? Shore isn’t the News of the World.) There’s a lot in this film from 1934 that’s very 21st Century. He gets all the credit while she does all the work. Typical Man of Aran. This video clip is part of the soundtrack British Sea Power made in 2009 to the famous / infamous 1934 Robert J Flaherty short film, Man of Aran. I saw British Sea Power at the Kentish Town Forum (more Irish connections) earlier this year and in the latter part of the gig, they started playing footage from Man of Aran on a huge screen behind the band. I thought it was mesmeric. As a relative newcomer to British Sea Power I had missed the release of their Man of Aran soundtrack CD at the time. I just watched the full DVD today: the original 1934 film with British Sea Power’s music over it. The beautifully shot black and white images of a small island community eking out its existence on the bare, windswept edges of the Atlantic Ocean – Aran is an island off the coast of Galway – are movingly beautiful. On one level, you can just enjoy this as a piece of cinematography. But for those who don’t know the story, there’s more to Man of Aran than that. Back in the 1930s, American film-maker Robert Flaherty wanted to make a film about people still living traditional lives in an extraordinary, remote, barren place, in the face of the power of the Atlantic Ocean. In 1934, like today, a tidal wave of modernity was sweeping through the world, while ethnographers and anthropologists were starting to record and study the vanishing traditional ways of life of people left behind by the Brave New World. But Man of Aran was not ethnography, or even documentary at all – it was very much art. What was depicted was as artificial as Tron: Legacy. 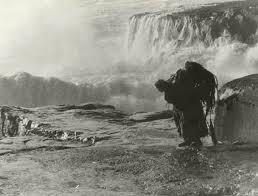 It was a reconstruction of a way of life that the people in the film no longer lived. They were real Aran Islanders, yes: but the ‘family’ featured was not a real family; and the fishing methods filmed in the basking shark sequences had not been used for decades. The fakery of the hunt anticipated Roy Scheider et al in Jaws by 40 odd years. Man of Aran was rather a kind of hyper-reality: an intensified, perfected version of the truth as Flaherty and – let’s face it – many viewers would like it to be. Flaherty paid islanders a fiver each to be actors in the drama of their own idealised lives. (Wikipedia on Flaherty\’s Man of Aran.) As Vince Trident put it in the British Sea Power sleeve notes, the effect was “at once heroic, stunning, camp, ridiculous.” Very post-modern and very Irish too. Roy Foster’s book on blarney, The Irish Story springs to mind (The Irish Story by RF Foster – review from The Independent). Mind you, if the current V&A exhibition is to be believed, post-modernism itself ‘ended’ at least two decades ago: (V&A Postmodernism Exhibition). So my writing here about postmodernism as if it’s current is itself as anachronistic as Flaherty’s film – if I can disappear into a vortex up my own arse for a minute. But Man of Aran has a currency today for another reason. It struck me, watching Flaherty’s stage-directed, fiver-toting Gaels, that their plight dramatises our own. We are between a rock and a hard place, just as they were. We are living through our own kind of austerity, though one that the islanders would sell their beshawled and crooked-backed grandmothers for. But we struggle on, scratching out our existences in the old ways, sensing things are just not sustainable – but not knowing how else to get by. And the waves keep crashing in. By the time Man of Aran was filmed, the way of life depicted had already passed. And I do sense we may perhaps be on the verge of a step change – over the next 10-15 years – in how we live and work, not just in the UK but in North America and Europe. It certainly felt like it listening to the second part of Michael Portillo’s documentary Capitalism on Trial (Capitalism on Trial (part 2) – Radio 4). The sense of us living through the end of an era is starting to grow. I’ve written elsewhere on this blog about some of the interesting thinking from Richard Layard, Will Hutton and others about the need to refocus our societies towards goals we actually believe are good and sustainable. Or will we just trudge on, gathering seaweed from the rocks to help grow our potatoes? This entry was posted in 21st Century Britain, All Over The World, Brand communications, Media, Qual Research, Semiotics, Shore, Society, Uncategorized and tagged art, Atlantic Ocean, authenticity, British Sea Power, cinema, communications, ethnography, happiness, Ireland, Man of Aran, music, Portillo, postmodernism, Radio 4, Roy Foster, the North, V&A. Bookmark the permalink.